The Borderless World Foundation, a group of youngsters with a humnitarian outlook to life, has been working to provide a much-needed human touch in the strife-torn border areas of India, including the Kashmir valley. Shoma Chatterji reports. In trouble-torn Jammu and Kashmir, thousands of children have been orphaned during decades of violence, and millions have had their childhood taken away and replaced by memories of strife. But for some of them, there may be a little hope now, ever since the Borderless World Foundation, a non-governmental, non-profitable, registered organisation based in Pune, Maharasthra, decided to intervene positively in their lives. The BWF, a group of youngsters with a humnitarian outlook to life, has been working to provide a much-needed human touch in the border areas of India. The project for J&K, which began in 2002, is named Basera-e-Tabassum (BeT), which means 'abode of smiles'. BeT is a rights and needs-based project, working towards the physical and psychological recovery and the social rehabilitation of these children. BWF's aim through this project is to provide food, shelter and education to orphan girl children between 4 and 10 years of age in the state. The emphasis is on their education. In 2003, two Pune activists, Bharati Mamani and Adhik Kadam came to the valley to establish an orphanage for girls at Salkote Haihama in the border district of Kupwara, where almost 24,000 children were at risk from the violence around them. Girl victims of the violence are looked after by BWF in three different places in the valley. BeT faced sustained opposition from local groups, who suspected its motives. Militancy in the area was another obstacle. It took two long years for BeT to convince local opponents of their sincerity. Another blow fell when Mohiuddin Mir, a local resident active in BeT's development efforts was killed by militants in February 2005. His son, Tanveer, along with Bharati, Adhik and Sheikh Zahoor, took up the task from where he had left off. An earlier 1998 short survey of Chewdara, Ohangam, Rathsun and Sanoor Kali Pora of Beerwah (A Tehsil Town of district Budgam) had revealed 70 families in need of immediate attention. The orphanage at Beerwah began to function in March 2006. One more home was started at Dialgam, Anantnag with 10 inmates in December, the same year. Salima Akhtar Bhat, 22, manages the BeT project in Kupwara district. She is in charge of more than 50 children who live in the home. "After Std. IX, I needed to support my family. So I went to Basera-e-Tabassum looking for a job. I only spoke Kashmiri, no Urdu. I had no idea about what work I could do. But Adhik Kadam, the chairman of BWF spent a lot of time explaining the functioning of the home to me. I ran away after a few months when the chairman had to go to Pune and the cook ditched us and I felt absolutely helpless. But my older sister persuaded me to go back and fulfill the responsibility I had taken up; that I could not just get up and leave. I came back the same day." Six girls from BeT orphanages are participating in a national photography competition in two categories - nature and human action. "Not once has the thought of leaving the home and the children has occurred to me since then. Even the local community here stands behind Basera-e-Tabassum and its cause," she explains. Salima did not know the language. She barely had a formal education. She was a teenager. Yet, she is now foster mother to 50 orphaned children whose parents were killed during the militancy. "I cannot think of marriage. Though I came here for a very selfish reason - earning money, over time, my work has evolved into a relationship that is a part of my life," she adds. In 2007, some girls were taken to Pune and Mumbai for an educational tour for 28 days. They studied a smatter of different languages and took part in extra-curricular activities like sports, music, drama and dance in some of the local schools. They were taken to a school for the visually impaired and were impressed when they saw the children lead independent lives. In Mumbai, they visited the Elephanta Caves, Essel World and R K Studios. "There are many organizations working for Kashmir but in my 11 years' experience, I have not seen even one organization working in Kashmir," says Kadam. There are around 24,000 orphans in Kupwara. The BWF established three orphanages in different parts of Kashmir - Kupwara, Budgam and Anantnag. It began functioning with four orphaned girls but now the number has swelled to more than 78. Currently, there are 83 girls in the three BeT centers and plans are afoot to take on more. But 83 is just the proverbial drop in the ocean of children in desperate need of putting their fragmented lives back together. According to a survey by various government and private agencies, there are about 24,000 orphans in Kupwara. Anantnag has 10,000 orphans and another 10,000 are in Budgam. The BeT would like to take in another 25 girls in its Anantnag orphanage. The expenses per annum for each child are calculated at Rs.16,800, which means they must find another Rs.4 lakhs to increase their support. BeT has decided to expand its project by beginning another centre in the state for Kashmiri Pandit girls from broken families living like migrants in their homeland. If 50 girl children are to be sheltered, the funds needed would be around Rs.13-14 lakhs a year - which covers boarding, lodging, education, warm clothes and administrative expenses. 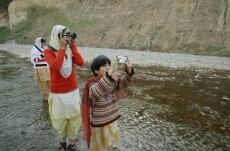 BeT Kupwara and Beerwah have around 59 girls at present, their ages ranging between three and 13. Each girl is given a healthy environment till adulthood, when she will be able to make her choice for the future. These girls study in private and government schools and have excelled in their studies. "It is not possible for BWF to support all the orphans. But BWF can become an example to many so that they can also work for orphans. Working for them is my spiritual way of living. The main reason for gathering them under a single umbrella is to bridge the gap between these orphans and the mainstream, to make them feel that there is the whole of India to take care of them and there is much more in Kashmir," Kadam sums up. Thirteen-year-old Jameela Bano (Sr.) of BeT Kupwara, says, "I was born a few months after my father, a militant, was killed by his group when he surrendered. My mother brought me to BeT in May 2002. I was scared of both Didi (Salma) and Bhaiya (Kadam) because I did not know Urdu. But things changed as I continued to live and learn here and I now want to become a computer engineer. Back in the village, they called me an orphan and they pitied me a lot which made me feel very sad. But when Didi and Bhaiya told me that I was God's child, that BeT was my very own home, and that I did not have to worry about anything but studies, I was really happy. I want to earn a lot of money when I grow up to help my mother and I also look after orphans like Didi and Bhaiya are doing." Dr. Shoma A Chatterji, freelance journalist and author, writes on cinema, media, human rights, cultural issues and gender in several print media and electronic publications in India and abroad.